Despite our bullish assertions, odds are we might see confirmations of last week bears especially if key support lines fail to hold. For Bitcoin (BTC)-as an influential and most valuable coin, $6,000 is a vital support line. That’s our trading position even if BTC prices are ranging without bulls finding the momentum to chart higher. Note that repeated failure for higher highs spells could usher in waves of selling. The Mt Gox saga continues. As the kinks of their bankruptcy proceedings are ironed out, it has been revealed that creditors would have to contend with payment in Bitcoin and Bitcoin cash only. Remember, the exchange has 160,000 BTCs, 168,000 BCHs, derivatives and residual cash from previous coin sales. Even though there is friction on how cash payments will be made, it is likely that priority will be given to monetary creditors before any other settlement is made. All in all, August details excludes payment in altcoins while Koyabashi, the Japanese Trustee won’t be liquidating any BTCs in open markets. BitHumb is the latest South Korean cryptocurrency exchange to experience a security breach. In a bid to enhance their service delivery and most importantly secure their customer’s fund, the exchange announced the resumption of deposit and withdrawal for Bitcoin (BTC) and eight other coins beginning Aug 4. In their end, they have tightened oversight with exclusion on Monero (XMR) in the process. We were clear in our last Bitcoin (BTC) technical analysis and while we are still net long, the six percent drop in the last 24 hours and the 14 percent decline in the past week mean BTC prices are trending within our buy zone. As visible from the chart, prices are in between $6,800 and $7,200 meaning we can begin looking for buys at this zone with stops at or just below $6,800. If anything, for buyers to recover, then the best approach is for pullbacks above $7,200. However, should there be confirmation of that bearish engulfing candlestick of Aug 4 and BTC prices edge below $6,800, we would suggest selling with first targets at $6,000. In a recent interview with Fortune, Binance CEO Changpeng Zhao thinks Ethereum stands no chance of competing against new entrants as EOS and Tezos. In his view—which is a little bit odd-he says there is slow development in the platform. It might be controversial coming from a market influencer but what is ridiculous is the simple fact that Ethereum has the highest number of developers working on different projects on the platform. Ethereum Name Service (ENS) has an exclusive deal with Minds + Machines Group Limited (MMX) for ENS to acquire what they call a “top level domain”. MMX is the company behind gTLDs or generic Top Level Domains. With this deal, websites or services planning on dispensing Ethereum offers would register with MMX’s .luxe domains. After periods of lower lows, ETH prices are yet again trading right at the main support line. In the last week, for example, Ethereum (ETH) sunk 12 percent and with such swings, prices slid $150 in roughly two weeks. As it stands, ETH is now on a precipice. In line with our prior Ethereum (ETH) technical analysis, all we need is a close below $400 for our official sells to be valid. Afterward, immediate sell targets would be at $350. However, should prices find temporary support and bounce back into our trade range, then our neutral position will still hold until after our initial Ethereum (ETH) trade plan is met. Together with 32 other coins, XRP stands a chance of listing at CoinBase custodial services. CoinBase custody service is a simple combination of their time-based cold storage, broker-dealer and reporting services and special client coverage program. CoinBase has offices in New York with a team in place specifically to cover institution investor influencing news within the crypto verse. To make this a reality, CoinBase shall partner with electronic transaction clearing (ETC) with the intention of providing this services to some select financial institution and hedge funds. There is nothing special as far as XRP price movement is concerned. So far, prices are stable and moving horizontally along a 5 cent trading range with caps at 40 cents and 45 cents. 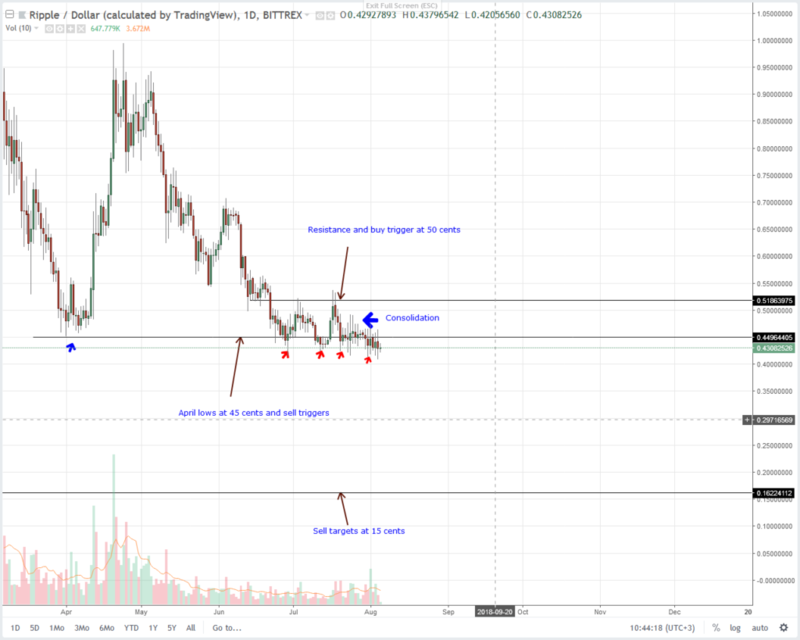 Because it has been this way in the last 60 days or so, all we need is a break below 40 cents for XRP sellers to be in charge in line with our prior XRP trade plan. On the flip side, buyers would kick-start a chart towards 70 cents and even $1 should we see a comprehensive close above 55 cents or July’s highs in the coming days. Going forward and before we see any of the above beings met, we shall retain our neutral stand executing trades once our trade conditions come to pass. A day after marking their first anniversary, Bitcoin Cash (BCH) daily transaction processing did outpace that of Bitcoin (BTC). Of course, this was monumental for BCH. Nevertheless, the transactions spike could be from BCH network stress testing. There is a new open source Woo Commerce plugin from CoinBase that allows for easy integration into Word Press built websites. With this plugin, customers can easily pay services or merchandise using cryptocurrencies as BCH and others. Even with our assertions, BCH is still trading below our monthly, intra-range support trend line and is less than $100 away from retesting $600. With this, not only was there a minor bear break out but prices did break below the 12-month support trend line in the weekly chart. Therefore, because of this, my recommendation is to sell BCH on highs with stops at $730 and first targets at $600. NEO’s investment arm, NEO Global Capital invests in Splyse following their purchase of MCT tokens. As they launch in Hong Kong, LocalCoinSwap plan on supporting NEO together with a host of other fiat currencies as the USD, GBP, Euro and CNY on their peer to peer exchange platform. Like Bitcoin Cash, NEO is trading below their monthly support trend line. Considering their rate of depreciation, it’s down five percent in the last day and trading right at the main support line at $25. Now, odds are we might see a confirmation of June 12 bear break out trade pattern as we mention in our last NEO trade plan. Technically, when that happens, the third phase-the trend resumption phase-as break out trade patterns dictates would be in force. In that case, our ideal first targets are $12, which is also Q3 2017 lows.